LOS ANGELES, CA. November 11, 2018: E! 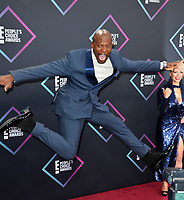 People's Choice Awards 2018 at Barker Hangar, Santa Monica Airport. Amber Stevens West & Damon Wayans Jr.